I had just played a 28-point word in online Scrabble (take that, Mondo!) when I heard the doorbell ring. I hadn’t even heard a car, and I wasn’t expecting anybody. Jake began to bark his head off. I looked out the window before opening the back door…there was an old man standing on my back step. There was a buggy parked in the driveway under my crabapple tree! What the hell? I opened the door a crack. “Yes?” I asked cautiously. “Thank you,” he answered as he came in the house. I grabbed Jake to keep him from jumping on the man’s white suit. 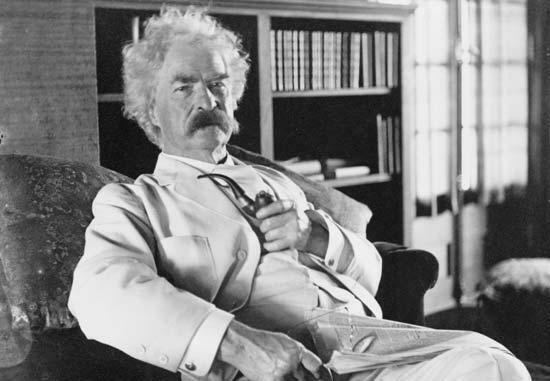 “I don’t have a cat…my fiancé’s allergic.” Wait a minute…Sam Clemens…that sounded familiar, I thought, searching my almost 50-year-old brain. Holy crap! “Not the Sam Clemens! You can’t be him! He’s been dead for 100 years!” I sputtered. “Okay,” I agreed, reasoning that I might have overindulged in cold medication, and that I was having a hallucination. I showed the visitor to a chair in the living room, and readied the food. “As an example to others, and not that I care for moderation myself, it has always been my rule never to smoke when asleep, and never to refrain from smoking when awake.” He grumpily put the pipe into his pocket. “So you came all the way from Connecticut? Our weather must seem quite different to you,” I commented, hoping I didn’t sound too lame…my ability to make small talk is limited. “What’s a blog?” he asked curiously. Writerwoman61: What is your philosophy of life? MT: Always do what is right. It will gratify half of mankind and astound the other. Writerwoman61: What is the secret to your success? MT: The secret to getting ahead is getting started. Writerwoman61: Are you happy with the person you are? MT: The worst loneliness is to not be comfortable with yourself. Writerwoman61: Everyone likes to be right…does it bother you when people think you’re wrong? MT: Whenever you find yourself on the side of the majority, it is time to pause and reflect. Writerwoman61: What happens when you lose your temper? MT: When angry, count to four; when very angry, swear. Writerwoman61: You must get depressed sometimes…how do you pull yourself out of it? MT: The best way to cheer yourself up is to try to cheer somebody else up. Writerwoman61: How do you deal with people who put you down? MT: Keep away from people who try to belittle your ambitions. Small people always do that, but the really great make you feel that you, too, can become great. Writerwoman61: What about people who are just using you for their own gain? MT: Never allow someone to be your priority while allowing yourself to be their option. Writerwoman61: How do you feel about honesty? MT: If you tell the truth, you don’t have to remember anything. Writerwoman61: What do you think of our politicians? MT: Better to remain silent and be thought a fool than to speak out and remove all doubt. Writerwoman61: What about political speeches? MT: If we were supposed to talk more than listen we would have been given two mouths and one ear. Writerwoman61: Are you optimistic about the younger generation? MT: The most interesting information comes from children, for they tell all they know and then stop. Writerwoman61: What is the biggest problem with young people today? MT: Don’t go around saying the world owes you a living. The world owes you nothing. It was here first. Writerwoman61: How important is a college degree? MT: Don’t let schooling interfere with your education. Writerwoman61: When trying to understand something, how important is it to ask questions? MT: He who asks is a fool for five minutes, but he who does not ask remains a fool forever. Writerwoman61: Do you have any advice about love? MT: If you want love and abundance in your life, give it away. Writerwoman61: Is one happier when one is in love? MT: To get the full value of joy you must have someone to divide it with. Writerwoman61: How do you find the right person? MT: When you fish for love, bait with your heart, not your brain. Writerwoman61: Once you’ve found that special person, then what? MT: Let your joy be unconfined! Writerwoman61: How do you want to remembered? MT: Let us live so that when we come to die even the undertaker will be sorry. I jerked awake when my alarm went off. “I had the weirdest dream…” I told Jim. 1. 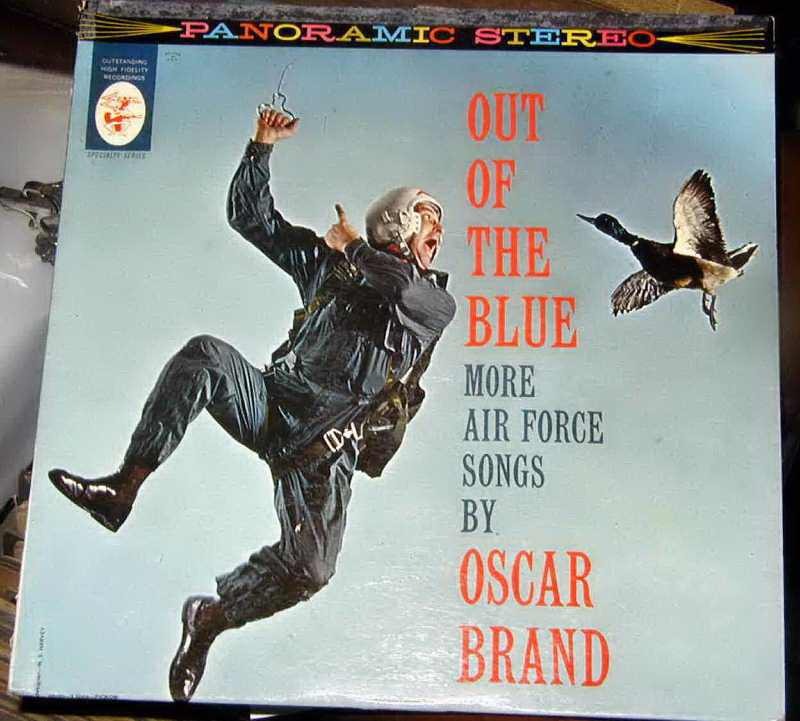 Oscar Brand. Born in Winnipeg in 1920, Brand moved to the U.S. as a young man. In addition to being a folk singer, songwriter, and author, Brand is also the host of the longest running radio show with the same host: Oscar Brand’s Folksong Festival has aired on New York’s WNYC-AM almost every Saturday night since December 10, 1945. From 1963-67, Brand hosted a Canadian TV show called Let’s Sing Out! which featured previously unknown Canadian singers such as Joni Mitchell and Gordon Lightfoot. Another one of Brand’s numerous claims to fame was serving on the original board of the Children’s Television Workshop, which was behind the creation of Sesame Street. It is said that the “Oscar the Grouch” character is based on Brand. Over his long career, Brand has composed more than 300 songs, and released nearly 100 albums. His songs have been used in movies, TV and stage productions, and even commercials. Brand is the author of seven books, including Songs of ’76: A Folksinger’s History of the Revolution. 2. Oscar Howe. Born on a Plains Indian reservation in South Dakota in 1915, Howe overcame physical and emotional obstacles to become a well-respected artist and sculptor. The young Howe began drawing before age 5, but was discouraged by his father, who confiscated his pencils and proclaimed art “foolish”. Howe switched to using charcoal from the stove, and when that was also taken away, used sticks to draw in the dirt. Like other natives at that time, Howe was sent to an Indian school, but was sent home at age ten because he had a severe, disfiguring skin disease complicated by a case of trachoma, which threatened the boy’s sight. There was no money for medical treatment, so Howe used commercial soap every day for months until his skin cleared up, and the eye affliction abated. He went back to school, graduating in 1933. After securing a job on a road crew, Howe came down with tuberculosis…this led to his enrollment in the Sante Fe Indian School, where he was chosen to participate in an art program known as The Studio. Howe’s first painting sold for 50 cents…half the money went to the school. After graduation, he taught art at the Pierre Indian School, the school that had sent him home. Howe later was an art instructor at the Pierre High School. After serving overseas in WWII, Howe became Professor of Art at the University of South Dakota. 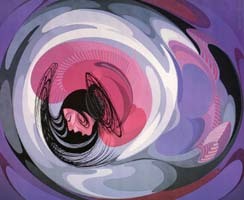 In 1958, he sent one of his most innovative paintings to a national Indian Painting Competition at the Philbrook Museum. It was rejected as not being a “traditional Indian painting.” He sent a scathing letter to the organizers, which was enough to move them to change the rules to allow for individuality. Howe died in 1983. 3. Oscar Pistorius. Pistorius is a Paralympic athlete known as “the fastest man on no legs” and the “Blade Runner.” Born in South Africa in 1986, Pistorius was missing both fibulas, so a decision was made to amputate his legs halfway between his knees and ankles when he was 11 months old. As a boy, Pistorius didn’t let what many considered to be a disability slow him down…he played rugby, water polo, and tennis in school, as well as being on the wrestling team. After sustaining a serious rugby knee injury in 2004, Pistorius was introduced to running, and hasn’t stopped since. He holds the world Paralympic records in the 100, 200 and 400-metre events and has competed against “able-bodied” athletes and won. 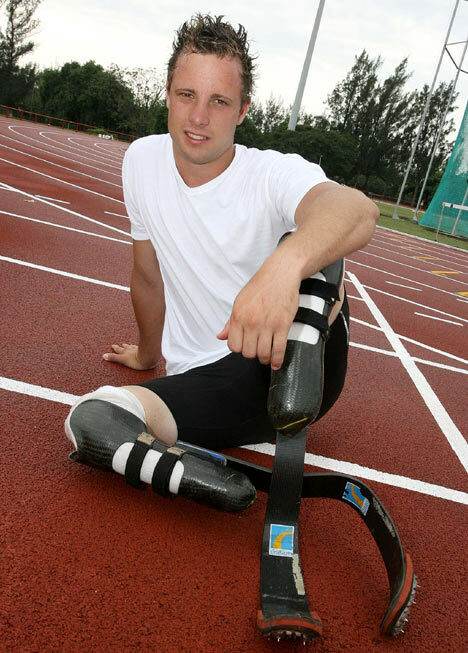 Pistorius’ career has been filled with controversy because some people in the sports community felt that the Cheetah Flex Foot prothesis that he uses to run give him an “unfair advantage.” After failing in his bid to qualify for the 2008 Olympics, Pistorius is now focussing on training for the 2012 Games in London. When he’s not training, Pistorius will be modelling, having signed up to be the “face” of Thierry Mugler’s men’s fragrance, A*Men. 5. Oscar Rejlander. Born in Sweden about 1813, Rejlander is known as “the father of art photography” and studied art in Rome before trading his paintbrushes for a camera. He moved to England in the mid-1840’s, where he opened a portrait studio in Wolverhampton. Rejlander was a friend of Charles Dodgson (aka Lewis Carroll), and later created one of the best-known portraits of him. Undertaking many experiments to perfect his work, Rejlander is credited with inventing combination printing (each print consists of images from several different negatives) in about 1853. Queen Victoria and Prince Albert were patrons of Rejlander’s, and among others, purchased a copy of one of his most controversial works, The Two Ways of Life. In 1862, Rejlander moved his studio to London and continued experimenting with double exposure, photomontage, photo retouching, and retouching. He also did popular “social protest” photos of homeless street children. 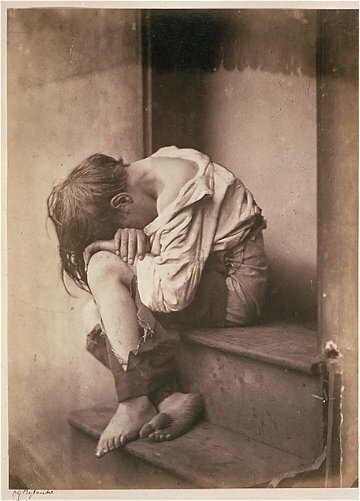 In 1872, Rejlander’s photos illustrated Charles Darwin’s book, The Expression of the Emotions in Man and Animals. Rejlander died in 1875 after a serious illness. I hope you’ve enjoyed this foray into the world of “Oscars”…more fun for me than boring celebrities dressed like waiters! Strength, Thy Name is Woman! 1. Bras. Contrary to popular opinion, the brassiere was invented by a woman: a New York socialite named Mary Phelps Jacob (aka Caresse Crosby). In 1913, she bought a new dress for a fancy evening affair, and was frustrated because the corset she wore under it was poking out in very unattractive ways and indiscreet places. Mary grabbed a couple of silk handkerchiefs and a pink ribbon, and the Backless Brassiere was born! Mary didn’t enjoy being a businesswoman, so sold her patent in 1915 to the Warner Brothers Corset Company for $1500. Over the next 30 years, Warner made over $15 million selling bras to women who were tired of wearing corsets! 2. Chocolate Chip Cookies. The invention of one of North America’s favourite cookies happened by accident. Ruth Wakefield was the proprietor of a tourist lodge called the Toll House Inn in Whitman, Massachusetts. She was making Butter Drop Do Cookies for the guests one day in 1930, when she discovered she was out of baker’s chocolate. Ruth substituted some broken pieces of Nestle’s semi-sweet chocolate bars, expecting it to melt and act the same way as the baker’s chocolate…it didn’t. 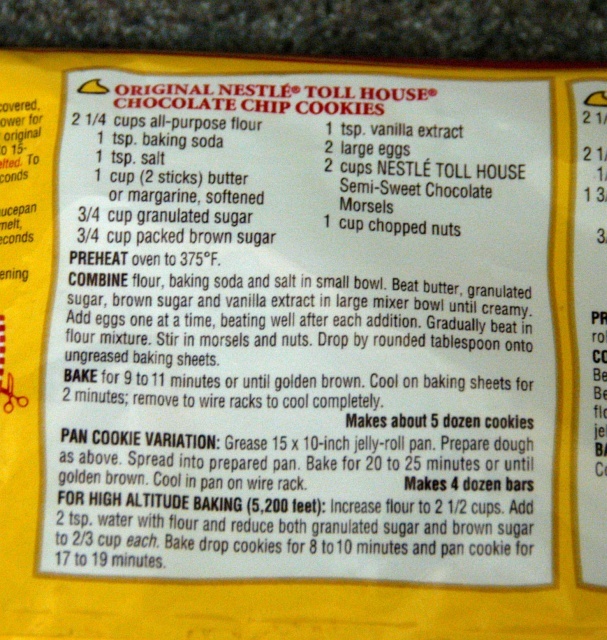 The result was delicious, and the recipe for Ruth’s Toll House Crunch Cookies was published in a Boston newspaper. In 1939, Betty Crocker featured the cookie on her national radio show. Sales of the chocolate bars soared! Ruth was no dummy…she made a deal with Andrew Nestle to print the recipe on the chocolate package in return for a lifetime supply of Nestle chocolate. 3. Dishwashers. 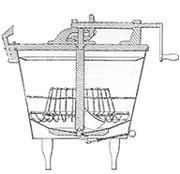 In 1886, Josephine Cochran got tired of her servants chipping her fine china in Shelbyville, Illinois…she declared “If nobody else is going to invent a dishwashing machine, I’ll do it myself!” She invented a hand-operated mechanical dishwasher, and formed the Crescent Washing Machine Company. Josephine unveiled her invention at the 1893 World’s Fair, but only hotels and large restaurants seemed interested in Josephine’s idea. The general public didn’t use dishwashers much until the 1950’s. The company Josephine founded to make her dishwasher eventually became KitchenAid (now owned by Whirlpool). Josephine Cochran: "It's hard to get good help!" 4. Disposable diapers. 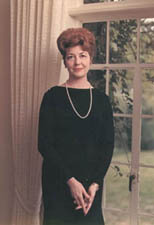 Indiana native, Marion Donovan, was a housewife and mother of two living in Connecticut after World War II. After changing her younger daughter’s sodden cloth diaper (and clothing and bedding) for the umpteenth time, Marion used a sewing machine to make a waterproof diaper cover out of a shower curtain. The Boater was better than rubber pants, because it had snaps instead of safety pins, didn’t cause diaper rash, and didn’t pinch the baby’s skin. The Boater flew off the shelves at Saks Fifth Avenue when they started selling it in 1949, although Marion was unsuccessful in attracting manufacturers willing to produce it. 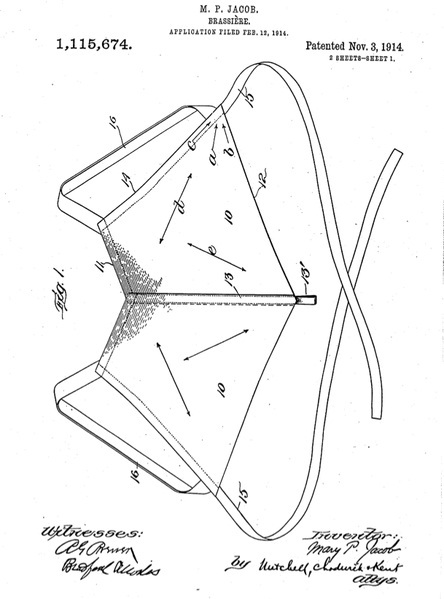 She patented it in 1951, and sold the rights to Keko Corporation for a million dollars. Marion then started working on creating a fully-disposable diaper, using special paper that was strong and absorbent, but also carried moisture away from the child’s skin. She shopped the idea around to all the large manufacturers in the country, but nobody jumped on it. 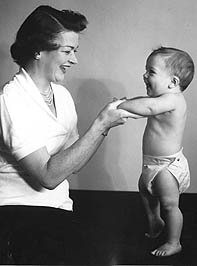 It was ten years later in 1961 that Victor Mills used Donovan’s idea to make Pampers. Over a 45-year period, Marion held patents for 20 inventions including the DentaLoop, a two-ply dental floss that eliminated the need for wrapping dental floss around one’s fingers. 5. Grocery bags. Paper bags used to be shaped like envelopes until Maine native Margaret Knight came along. While working in the Columbia Paper Bag Company, in Springfield, Massachusetts, she created a new machine part that automatically folded and glued the paper to form a square bottom. Workers installing the equipment argued with her, because they didn’t think women knew anything about machinery. 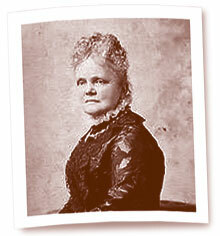 In 1870, Margaret founded the Eastern Paper Bag Company. 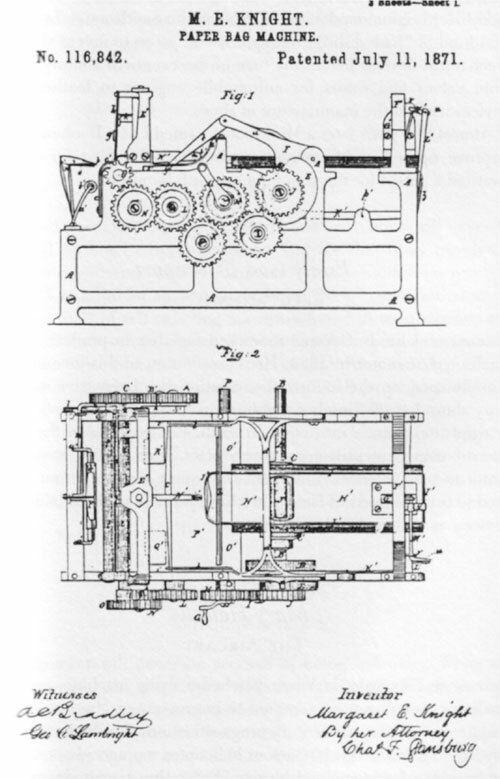 After patenting her bag machine design in 1871, she went on to be awarded some 26 patents for different inventions including a window frame and sash, machinery for cutting shoe soles, and a rotary engine. Apparently, Margaret's male co-workers were wrong...she did know about machinery! 6. Liquid Paper. Bette Nesmith Graham wanted to be an artist, but life got in the way. Shortly after World War II, she was a divorced mom with a son (Michael Nesmith, later of The Monkees) to support, so Bette got a job as an executive secretary at a bank in Dallas, Texas. Bette was a conscientious worker, and sought a better way of correcting her typing mistakes when she made them. As a painter, Bette knew that artists painted over their mistakes on canvas…why not apply the same idea to paper? She brought in some tempera paint and a watercolour brush, and started using them at the office. The boss didn’t notice, but her co-workers did, and asked for some of her correcting fluid. Bette put some in a bottle, and labelled it “Mistake Out” before passing it to her friend. In 1956, Bette launched the Mistake Out Company from her home, using her kitchen as a laboratory (with some advice from Michael’s high school chemistry teacher), and working nights and weekends to meet the demand for her hot new product. She was finally able to devote all her time to the business after being fired from her secretarial job for an error even Mistake Out couldn’t correct (she typed her company’s name instead of the bank’s)! In 1962, Bette married Robert Graham, who joined her in running the company, which grew into a million dollar business by 1967. The business was renamed Liquid Paper in 1968. Bette sold the company for $47.5 million in 1979, and died six months later. 7. Trashcans with the foot pedal. A native of California, Lillian Moller Gilbreth was a superwoman before it was fashionable: she was an inventor, author, industrial engineer, and industrial psychologist. When she wasn’t busy with that, she looked after her twelve children (her daughter and son wrote Cheaper by the Dozen)! Lillian was a pioneer in the field of ergonomics, and she and her husband, Frank, were among the first scientists to acknowledge the effects of stress and lack of sleep on the worker. 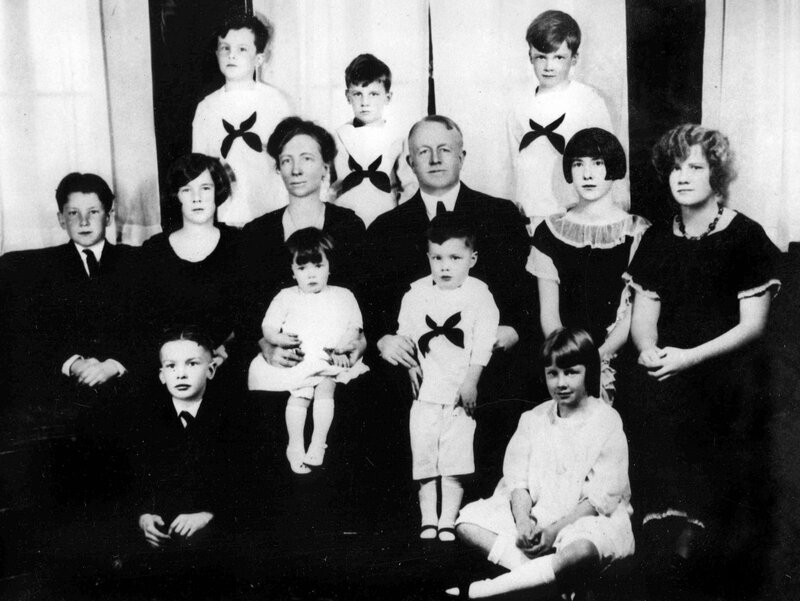 Their Time and Motion Studies were developed in part from living with their huge family. In the 1920’s, Lillian worked doing marketing research for Johnson and Johnson. Lillian was later employed at General Electric as an industrial engineer, and interviewed over 4000 women to design the proper height for stoves, sinks, and other kitchen fixtures. She patented many kitchen appliances, including an electric food mixer, shelves inside refrigerator doors, and my favourite: the trashcan with the foot pedal. There are dozens of things invented by women…here’s a link to a list: http://www.buzzle.com/articles/famous-women-inventors.html . I hope you’ve learned something today…I did!